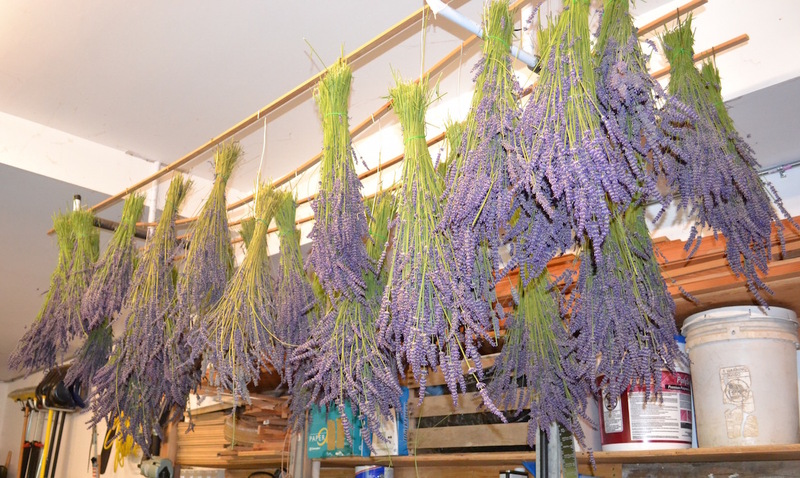 I have a shocking confession: My husband and I grow about 700 lavender plants in five different species. Why? you ask. Or maybe you shouted, Why? Well. We moved from Houston Texas to Washington state to live on five and a half acres close to the coast and the Canadian border. 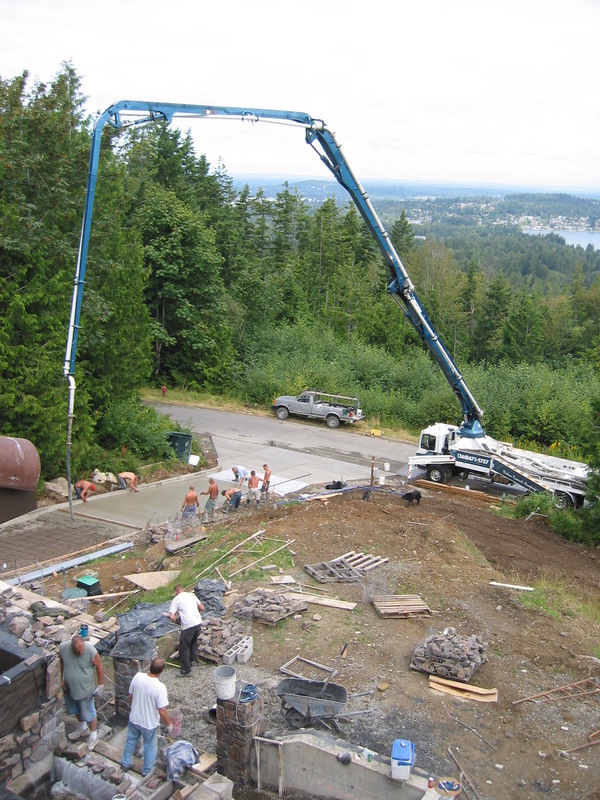 We built our dream home on a forested hill and when we moved in, we had no front door, no driveway, no front walk, and the yard looked like Mordor. 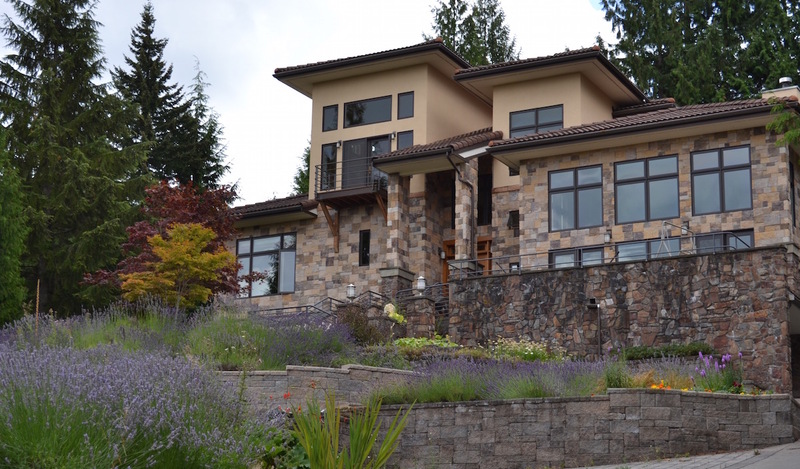 We knew we didn’t want to care for acres of lawn, so we went looking for a perennial that would be easy care and environmentally responsible. 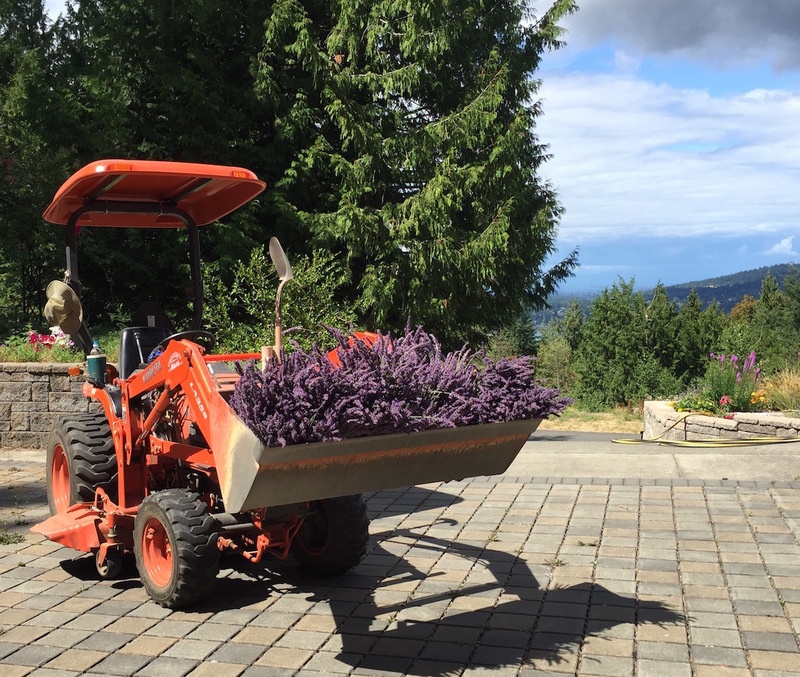 We settled on lavender, a tough plant that doesn’t need watering or fertilizing. Bees love it. Deer don’t. That sounded good to us. 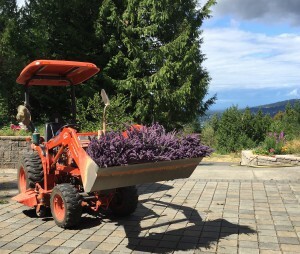 So without knowing anything else, we started planting lavender. 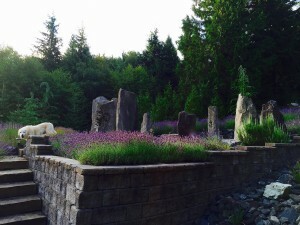 In the first three years, we may have gotten carried away — we probably planted 500 plants. We then discovered if you don’t trim the lavender before winter, certain species reproduce from seed and in the spring you’ll have volunteers. That’s how we ended up with 700 plants. 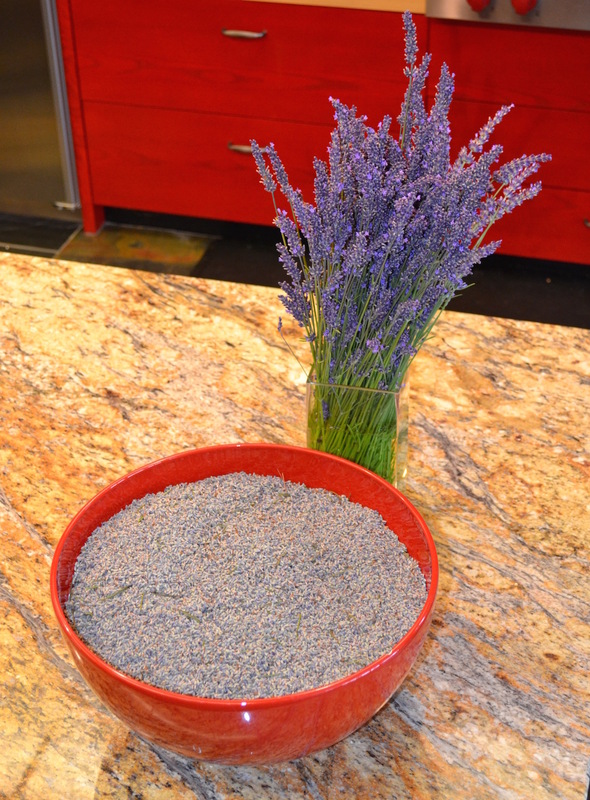 What do we do with all that lavender? 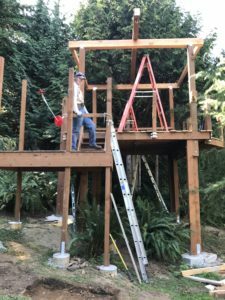 …Right now he’s working on a treehouse. You know him — it’s not a little treehouse. The man will tackle anything. While the lavender is in bloom, he cuts bouquets (he uses a hand scythe) and gives them away to anyone who will take them. Next he cuts bundles of lavender and loads them into the tractor and hauls them up to the garage. There he hangs them in our garage to dry using the professional method of bent hangers on wooden slats placed over bicycle racks. Okay, maybe it’s not really professional, but it works and we had all the materials. 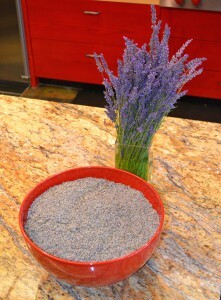 (Interesting fact we discovered — lavender discourages rodents and other pests. No wonder medieval people valued it so much!) When the stems are dry, he shakes them out and harvests the buds. The red bowl contains about one dry batch … the bowl is our popcorn bowl and huge. He stores the buds. We put them in decorative boxes as gifts. 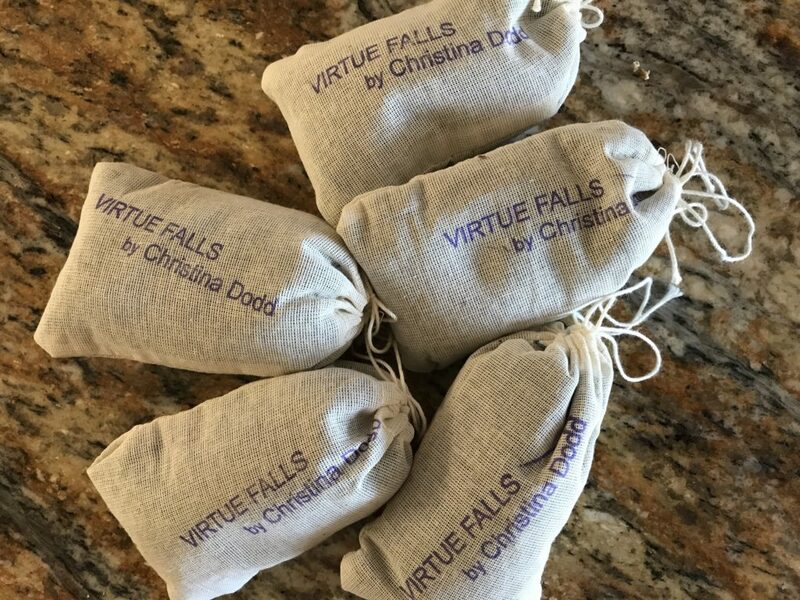 He makes “Cape Charade” sachets for readers who come to my booksignings, to leave with booksellers to give away, and as a lagniappe to contest winners. I would love for you to Join my mailing list for your chance to enter the contests and find out where and when I’ll be signing books. The sign up form is right here on this page. Want to find out more about my books? Click for my, “Books by Series and in Order,” page. You can find out more about the building of the stone circle here. Take a video tour of my office, and listen while I answer reader questions.